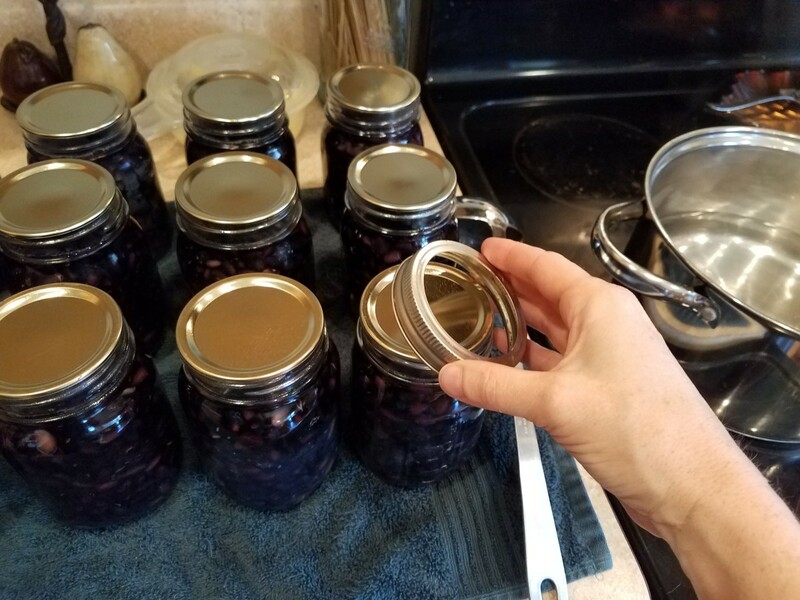 For many, pressure canning might sound a little intimidating or difficult. Trust me though when I say that the result outweighs any initial difficulty, and with a little practice, you'll wonder what you were ever scared of. We can, or preserve, the majority of food in our household. 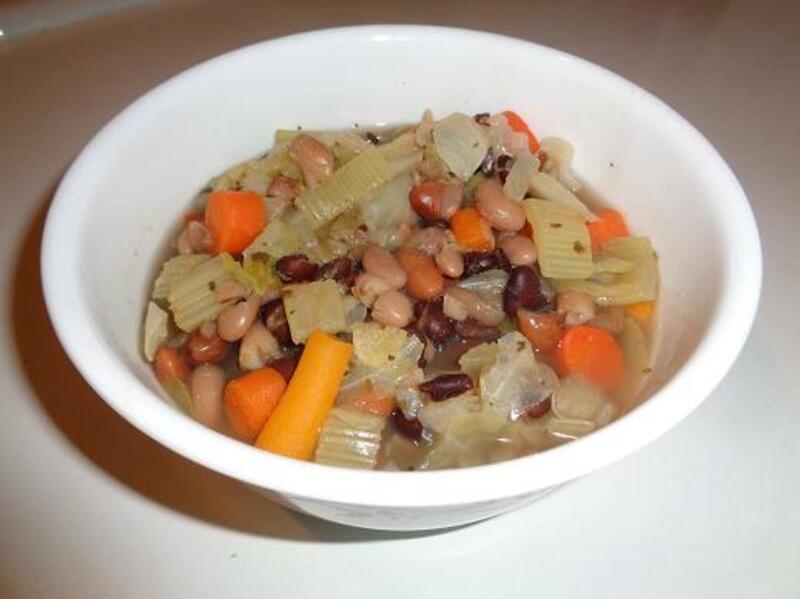 I currently can just about every bean you can think of, like black beans, green beans, pinto beans, black-eyed peas, lima beans, kidney beans, and Great Northern beans. I even make refried and baked beans. I also can a host of other veggies and fruits, pasta sauce, salsa, ketchup and bbq sauce, preserves, etc. We really enjoy making own own food products over here. Not only does that mean that my family gets a better food product to eat, but I can control the ingredients going into each of the jars. And I get the bonus of getting a great deal of satisfaction out of making food for my family. My children really like helping out with the process as well. Many times you'll see my children's faces helping out in my recipes. 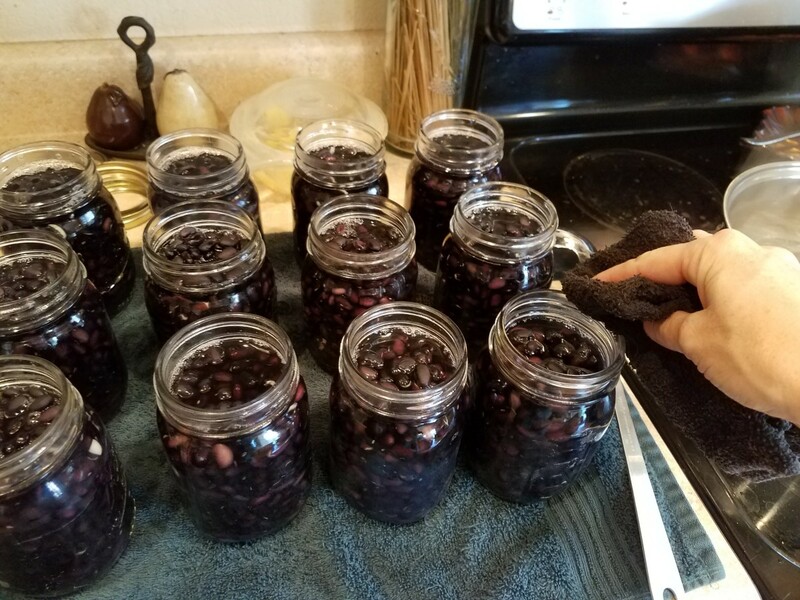 This really does become a family affair, and it helps to teach my children how to eat better and how to preserve food for their future families as well. 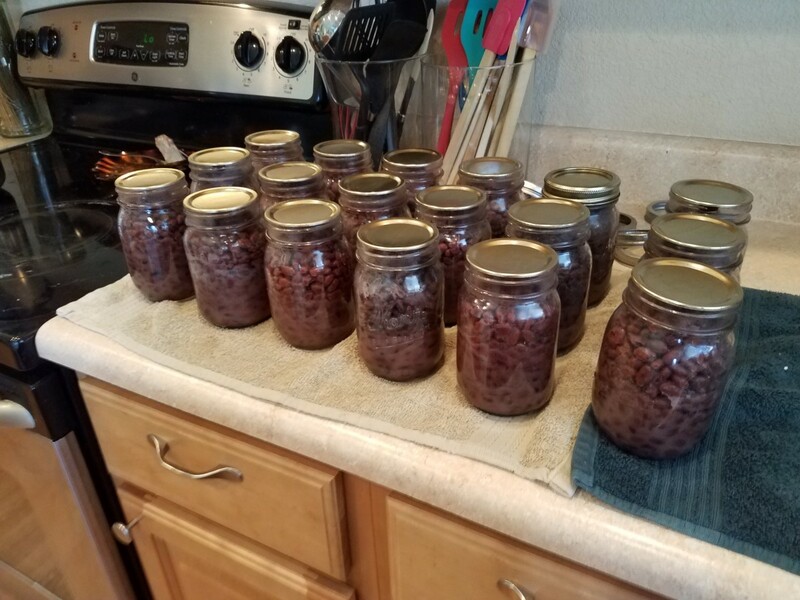 I really love canning! 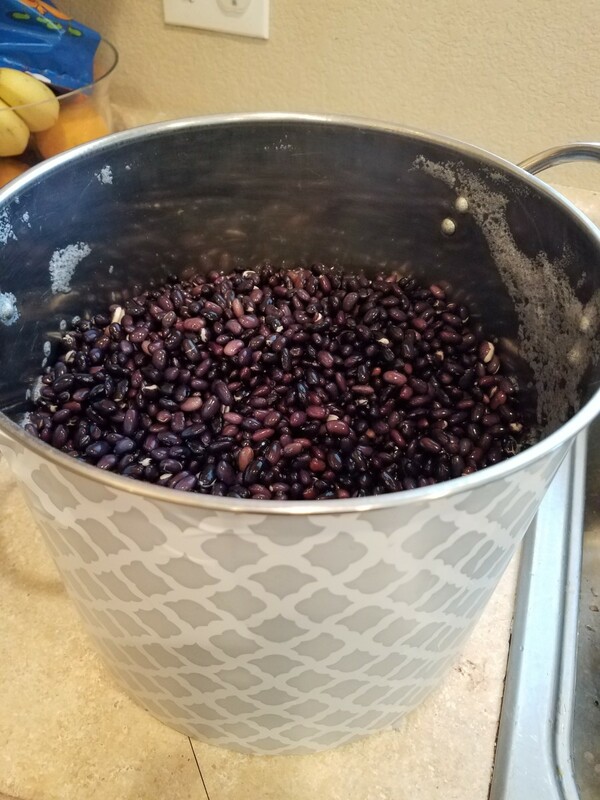 Start the process the night before you wish to can any dried beans by dumping your dried beans into an extra-large stock pot and filling it to the top with water. 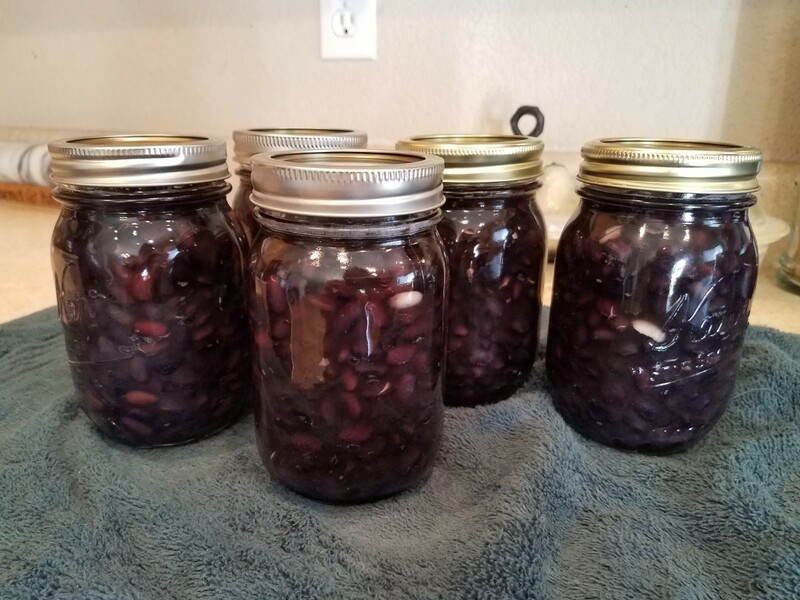 Leave your beans overnight to soak. 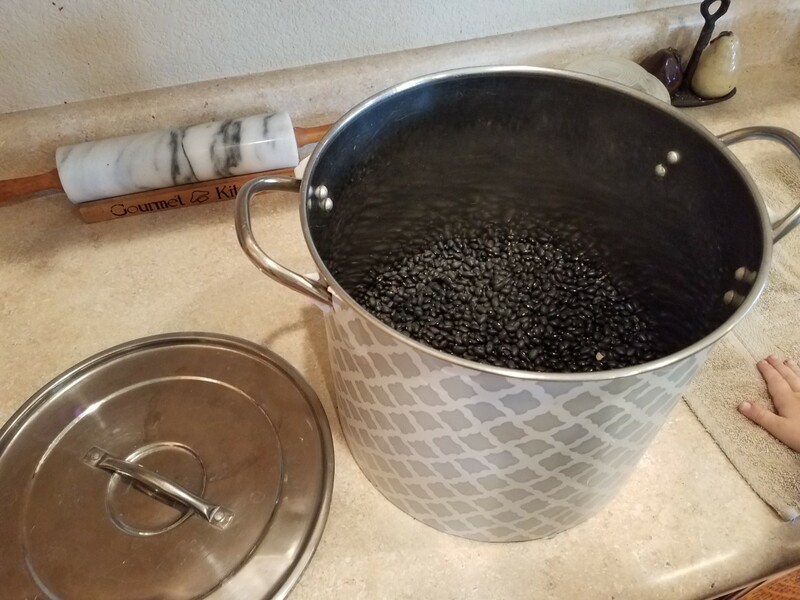 The next morning, drain any liquid off of your beans and rinse them in a colander before using them. Start your canning process by setting out your canning station. You'll need a pressure canner and a large pot of water to boil. 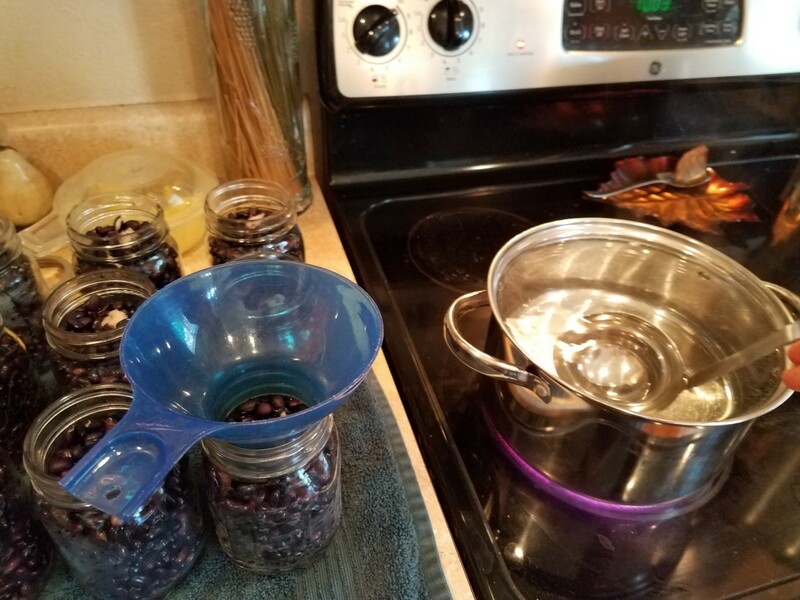 One one side of your canner, set out your rinsed black beans, your pint jars with lids and rings, your canning kit full of canning tools, a large ladle, salt and measuring spoons all on top of a towel. 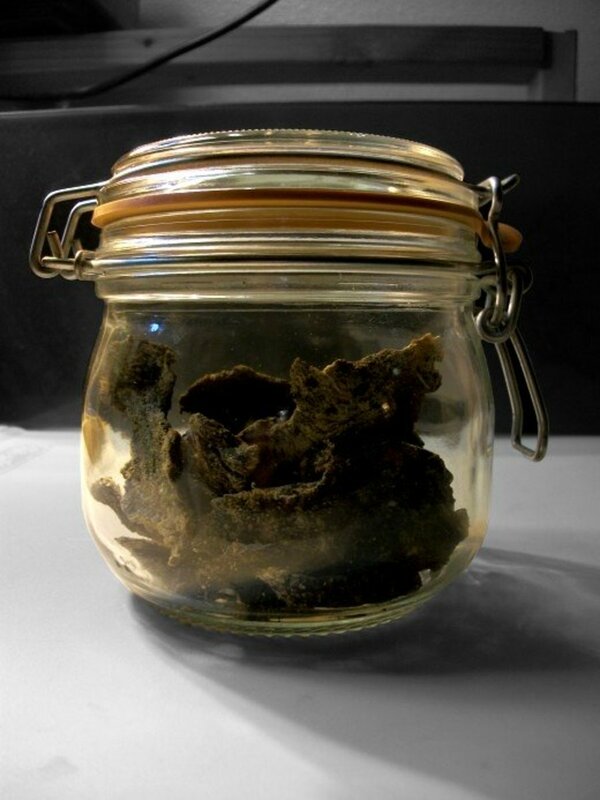 On the other side, set out a towel to set your jars to cool once they are finished processing. Get your pot of water boiling. 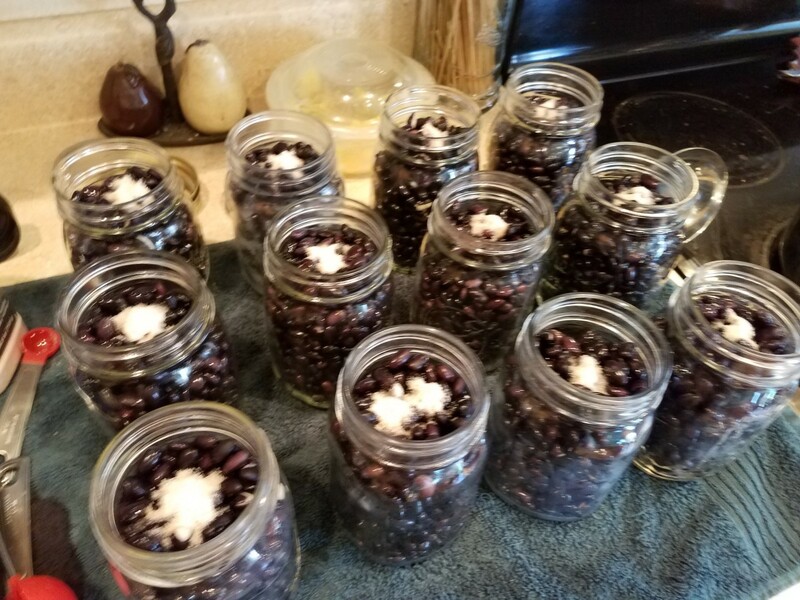 Using your large funnel from your canning kit, fill each of your jars with black beans to the neck of the jars. Then add 1/2 teaspoon of salt to each jar. Finally, fill each with boiling water to the neck of the jars. Wipe the rims of your jars with a damp washcloth to remove any liquid or food. Add a clean lid to each jar and then twist a ring onto each one, but only until you feel the slightest resistance. You do not want to tighten your lids. 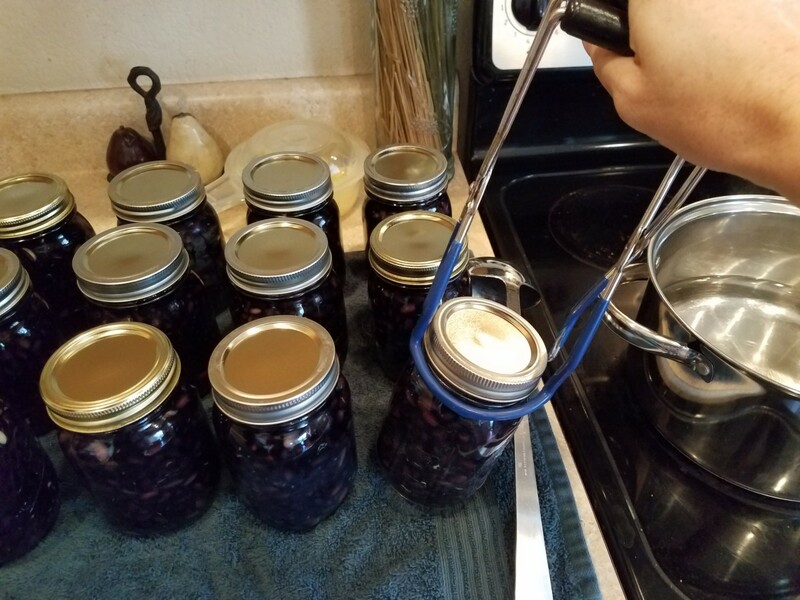 Using your jar lifter, gently move each jar into your pressure canner. 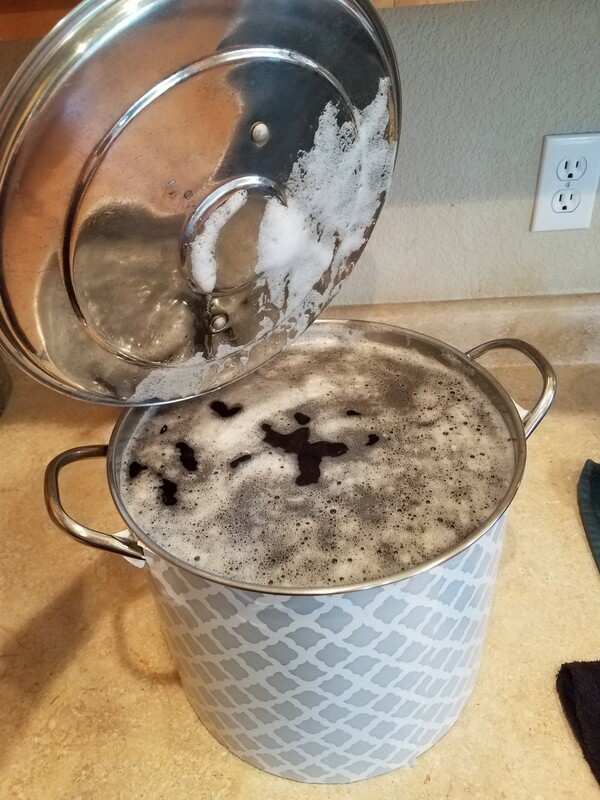 My canner only holds 9 pints. You'll have to figure out how many yours holds. 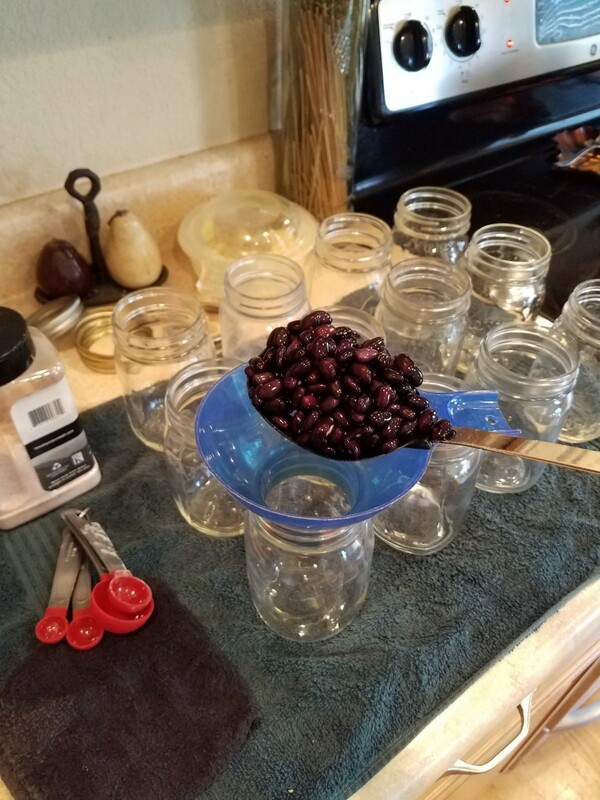 Fill it with as many jars as possible without them touching each other or the canner. I'm assuming that your canner came with a jar rack for the bottom. If not, place a small towel in the bottom of your canner to place the jars on. 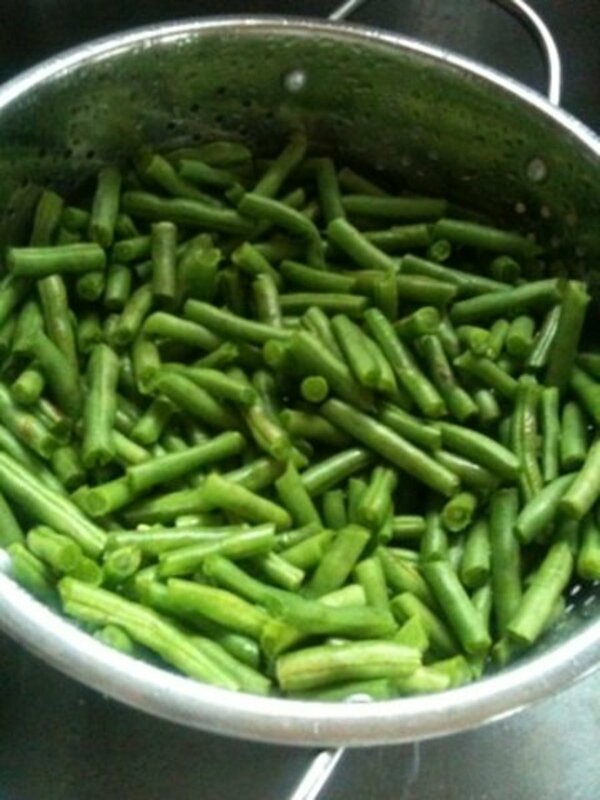 Fill your canner with 3 quarts or 12 cups of water. It's important that you put no more or no less water. Put the lid on your canner. The lid should have instructions to help you. Turn the heat to medium high and let the pressure naturally build up in your canner. This should take about 10 minutes. Then you'll see steam pouring out of the top spout of your canner, and the lid lock will pop up in the back. This is called venting. 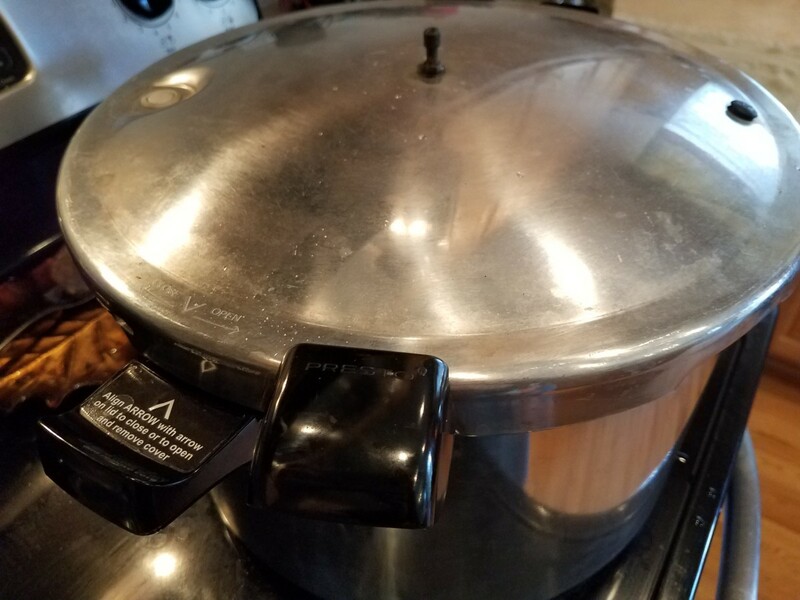 You'll need to allow your canner to vent for 10 minutes from the time you first see the forced steam. Now your waiting for your rocker to start rocking back and forth. This will likely take 5-10 more minutes. When the rocker starts moving, set your timer to 1 hour and 15 minutes. This is consistent for all dried beans. Start turning your temperature down. You'll want to find the lowest temperature on your stove where the rocker will rock as slow as possible without stopping. If it stops, you'll have to get it moving again and start the timer over again. This will come with practice. My right temperature is about medium heat. 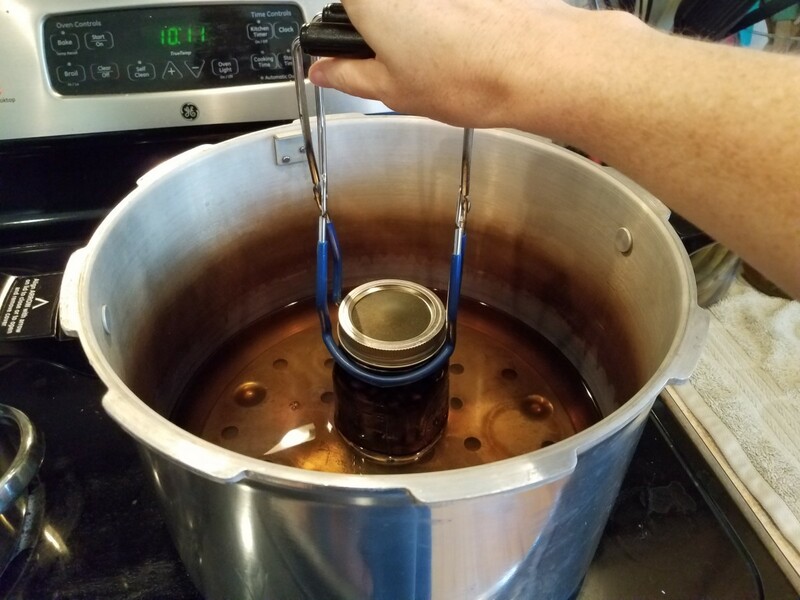 Process the full 1 hour and 15 minutes, and then turn the temperature off and slide the canner gently to a cool spot on your stove. The canner will need to cool off and release pressure naturally and drop the lid lock, which takes about 1 hour to 1 hour and 30 minutes. Please do not try to remove the rocker or the lid before it's ready. It's bad. When the lid lock drop on the lid, remove the rocker and set it aside. Let the canner continue to cool for more 10 minutes before touching the lid. After 10 minutes, remove the lid facing away from you so the steam doesn't burn you. Gently remove your jars with your jar lifter, and set them on your towel to cool for 24 hours. All of the lids should pop down when sealed and they should make a ping sound when you tap on them. 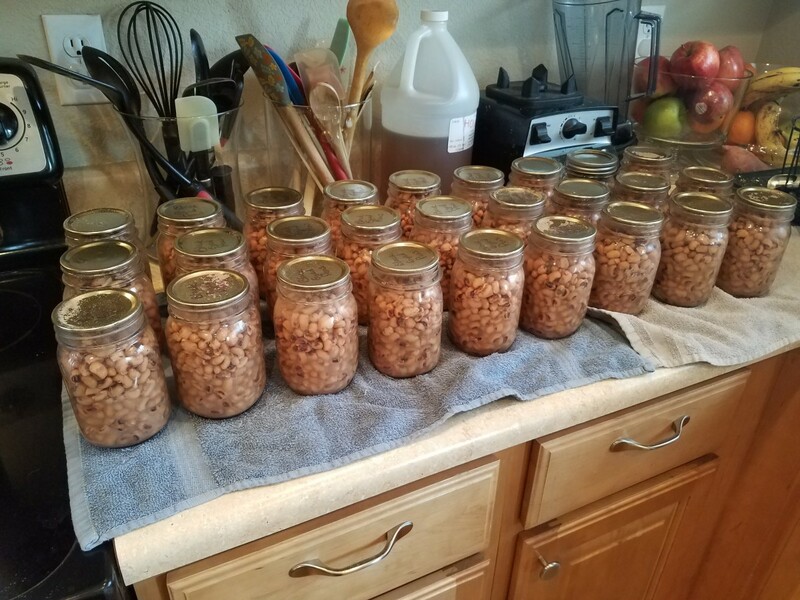 If they thud instead, they will either need to be put in the fridge and used over the next few days if there are 3 or less unsealed jars. 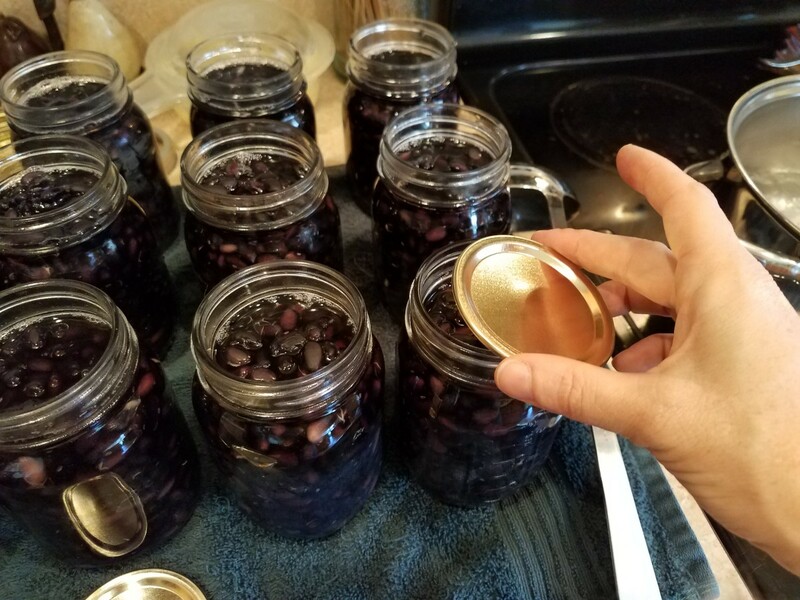 If there are 4 or more, you can remove the lids and rings, refill with water, replace with a new lid and start the canning process over again. For those that sealed, label them with the date and what's inside and remove the rings. The rings can encourage bacteria growth and compromise your contents. Store them in a cool, dry place. They should last for about a year. 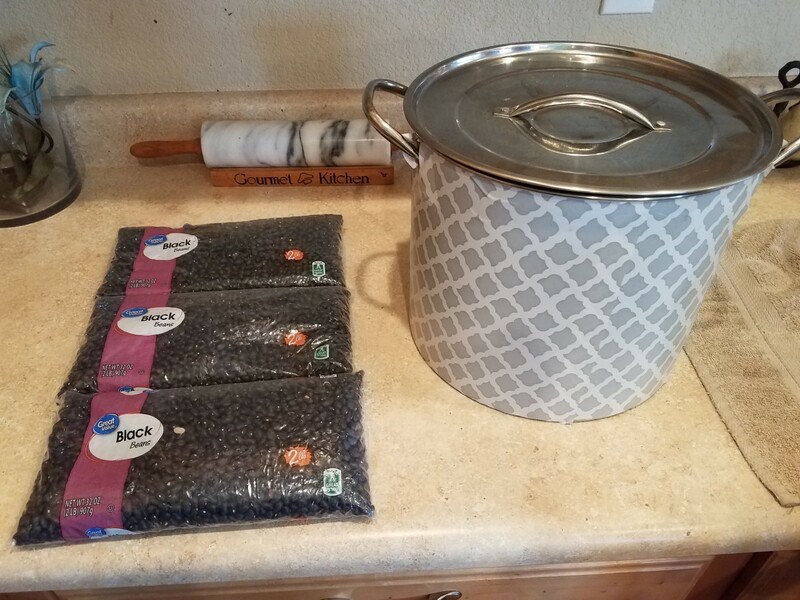 Start with dry black beans and a very large stock pot. 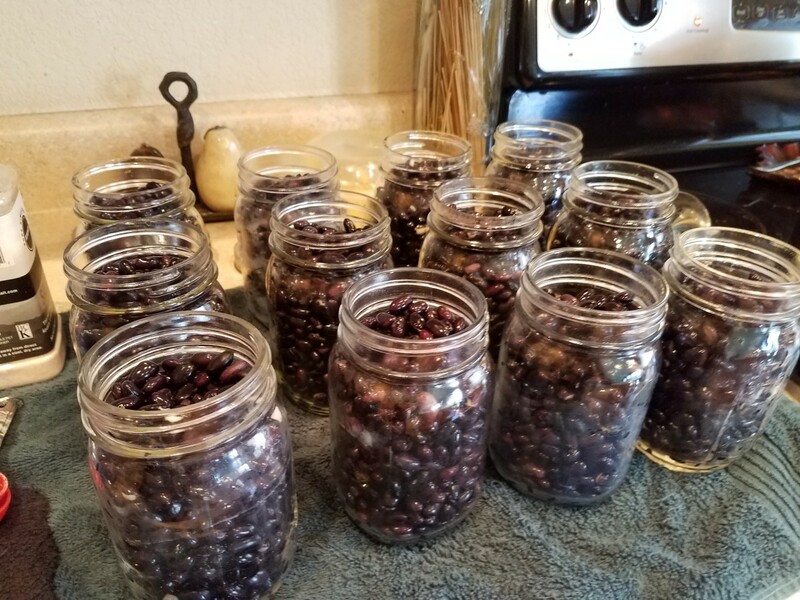 I get my beans in bulk from Walmart. Pour them into your pot the night before you wish to can and fill the pot to the very top with water. Soak them all night long so they can soak up as much water as they need. 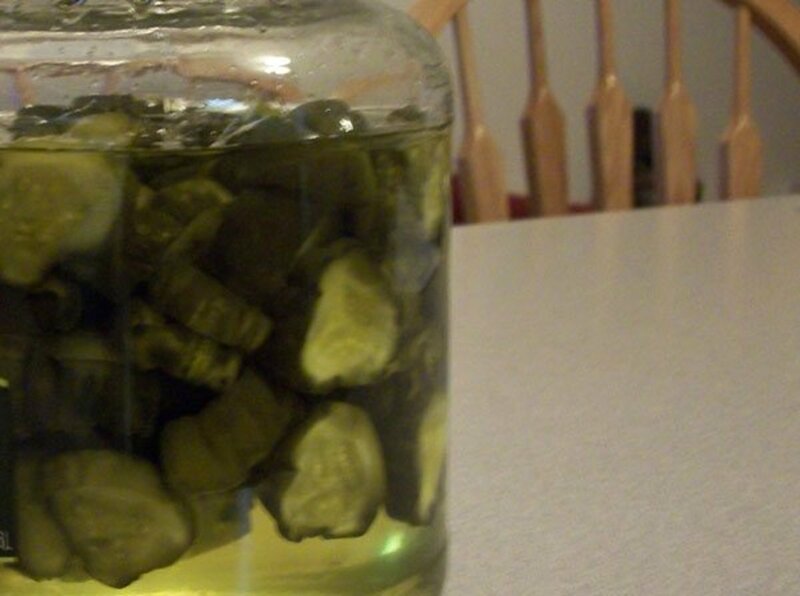 You don't want them swelling up in your jars. 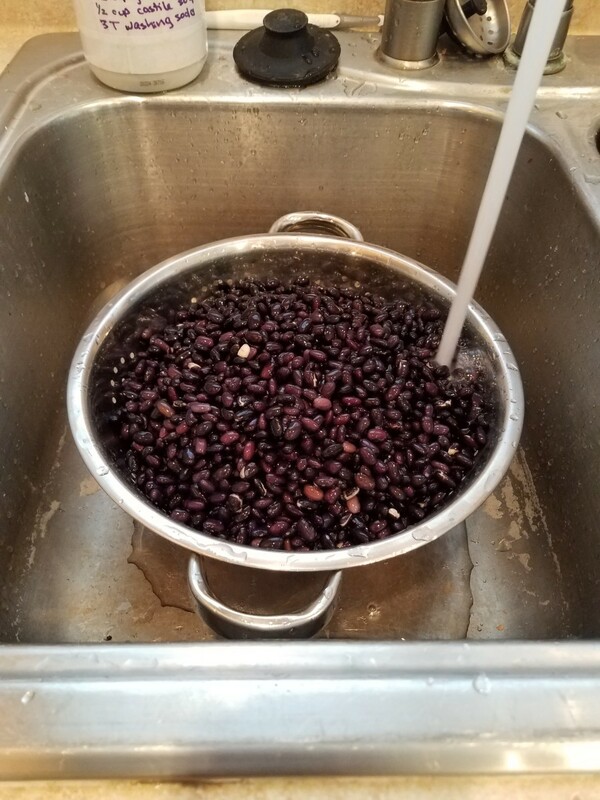 In the morning, drain the liquid off of your beans. Pour them into a colander and rinse them before using. 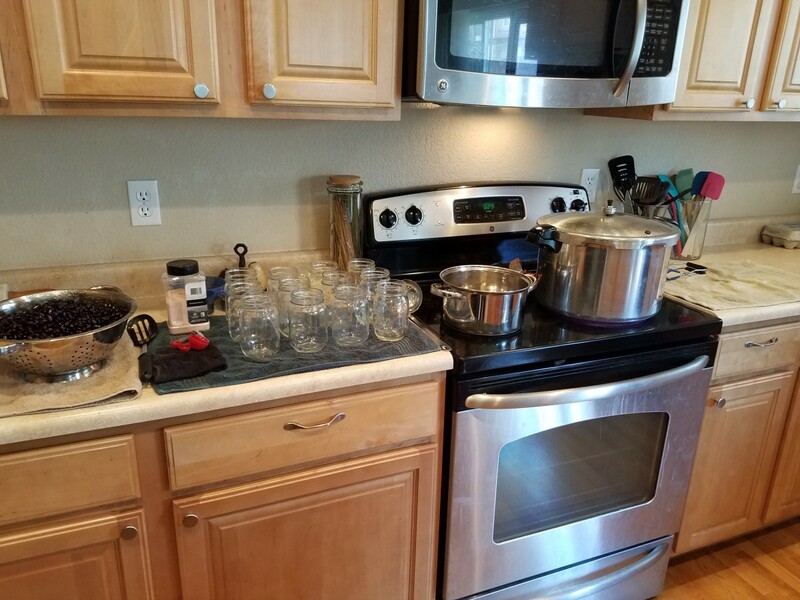 Set out your pressure canning station. 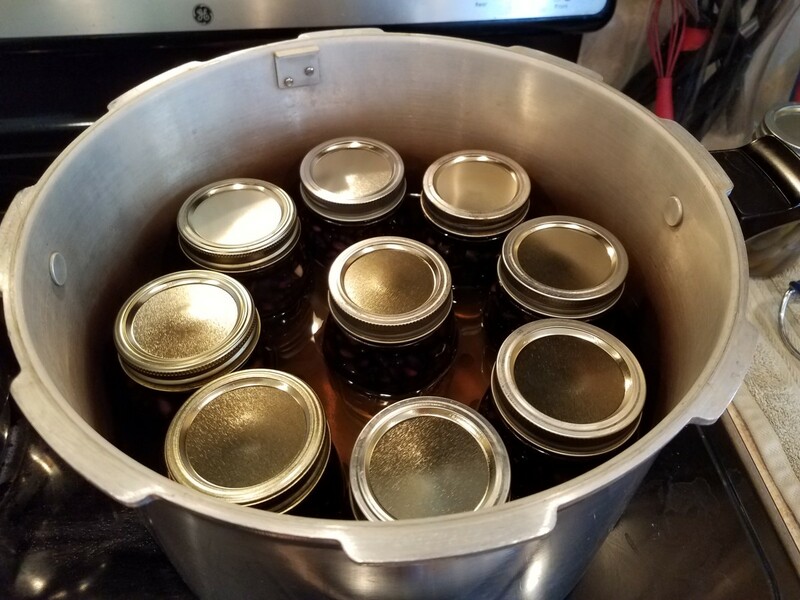 You'll need your pressure canner and a large pot of water to boil, clean pint canning jars with lids and rings, a large ladle, a canning kit of tools needed for canning, salt, measuring spoons, and a towel. 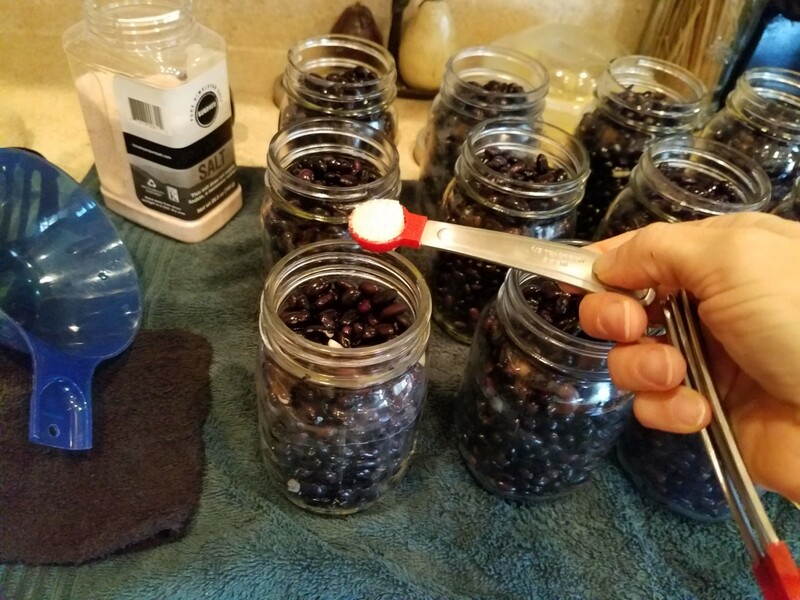 Using your funnel from your canning kit, fill each jar with beans up to the neck of the jars. Add in 1/2 teaspoon of salt to each jar. Now fill each jar with boiling water up to the neck. Wipe down the rims with a damp washcloth. Twist a clean ring onto each jar, but only until you feel the slightest resistance. With your jar lifter, carefully place each jar into your pressure canner. Fill pot with 3 quarts of water. Place the lid on the canner. Your lid should have instructions for making this easy. I love having these babies available any time I need them for enchiladas, taco soup, chili, nachos, taco salads, and even just for a quick side dish when I need one. And it makes me feel really good serving these to my family knowing that I prepared them myself and know that they are filled with good ingredients. 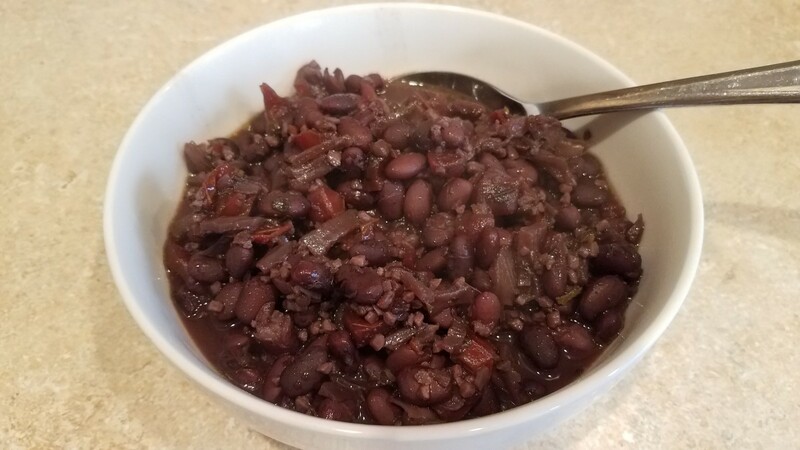 Black beans are filled with all sorts of valuable vitamins and minerals that you body needs, like iron, phosphorus, manganese, magnesium, vitamin B1 thiamine, copper, folate, fiber and protein. 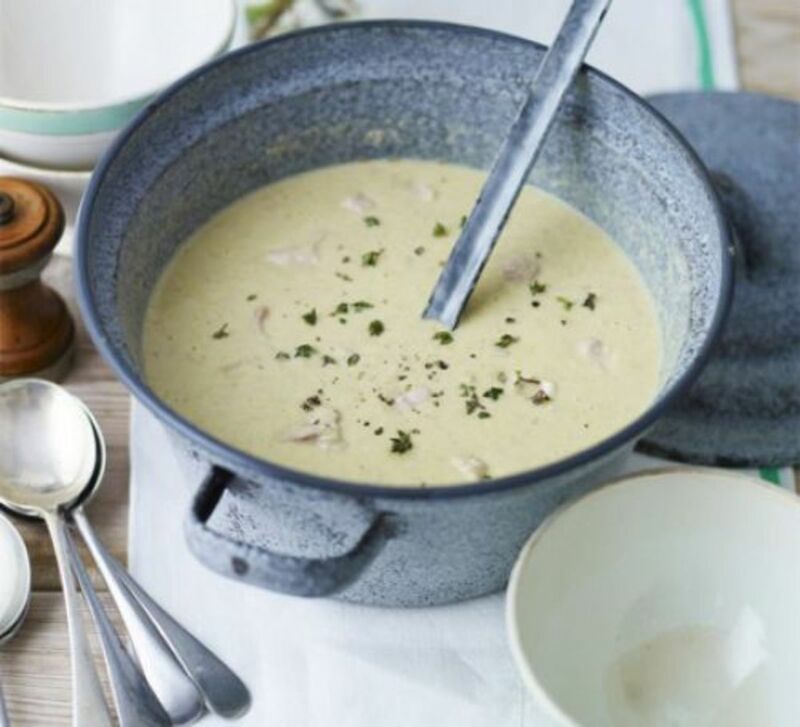 You definitely can't go wrong adding them to your meals throughout the week. I sure hope you enjoy this recipe. 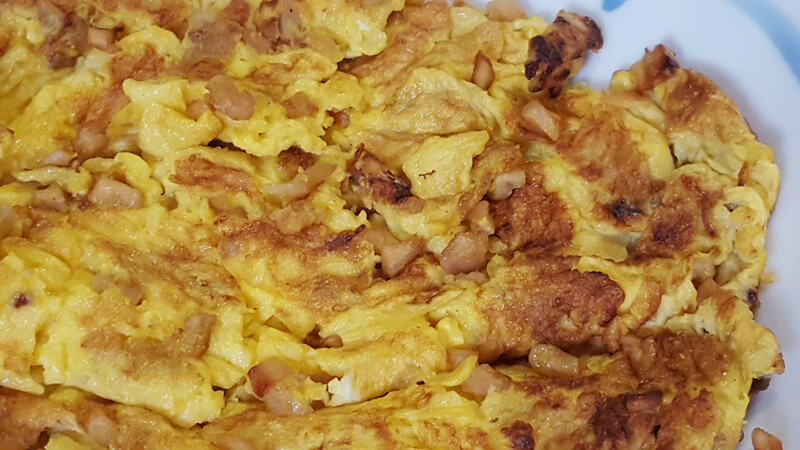 If you would like even more recipes, follow my profile for them all.